In 2003, there were multiple sightings of a white wolf in Hayden Valley. By 2004 this wolf bred with a large uncollared gray wolf, becoming the alpha pair of the new Hayden Valley pack. They bred again in 2005, but remained uncollared until 2006 when both of their ages were estimated at 5-6 years old. Genetic samples indicated that the alpha female (540F) was born into the Nez Perce pack and the alpha male (541M) was originally from the Swan Lake pack. In 2007, a black pup was born into the pack meaning that at least one of the parents was an unidentified black wolf. Both of the alphas were killed during an interaction with the Mollie’s pack later in 2007. The pack persisted, led by a new white alpha male (later collared as 639M and identified as a Leopold pack wolf), but relocated its territory outside Yellowstone to Montana in 2008. 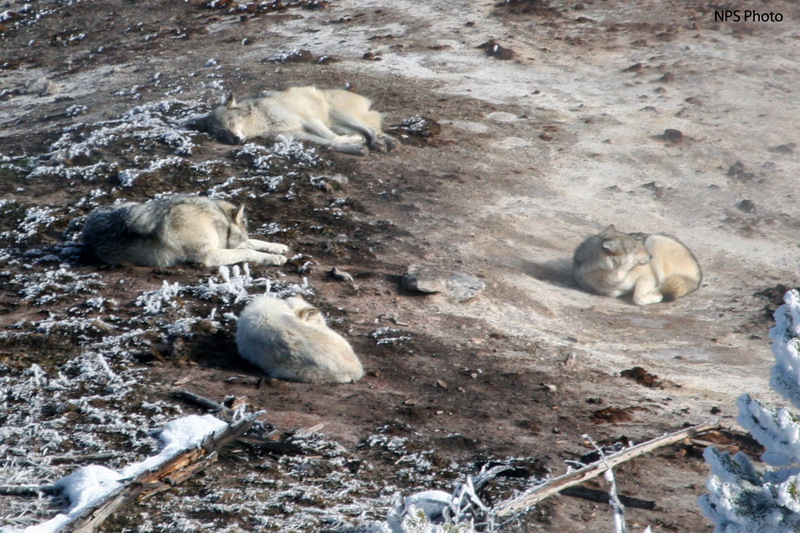 The Hayden Valley pack’s territory was occupied soon after by the Canyon pack, whose white alpha female is thought to have been born into the Hayden Valley pack.